Doctor Mom: Hard to Part with the Pediatrician? I get many questions about what I do. If I see kids, parents and patients think I am a Pediatrician. If I see an adult, they will think I am an Internist. The truth is that I AM both. 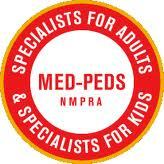 I am board certified in both specialties (Internal medicine & Pediatrics) aka Med-Peds. Med-Peds doctors like myself are well trained and qualified to see patients of any age. We complete a 4 year residency in our field, and actually have the same board certification as an Internist or a Pediatrician. Med-Peds physicians can practice primary care, or sub specialize in any field of either Internal Medicine or Pediatrics, or both. One area that Med-Peds doctors shine is in the transition of adolescents from pediatric to adult care. Many adolescents are hesitant to leave the comfortable environment of the pediatrician's office as they are getting older, leaving them without a "medical home". We serve these patients very well as we can begin to see them at a young age and follow them through adulthood. Many parents also find our type of practice attractive because they are able to bring their kids into be seen, and if they are also sick, they can be seen as well. I am proud of my specialty and a recent article in the Wall Street Journal highlights our field. Check it out. And go ahead, search for a Med/Peds doctor in your area! Found you through another blog. I have the same type of doctor. My friends thought it was nuts to not have a separate doctor for my son. But really? We all usually need to go in anyway. And, when you are two full time working parents...you don't have time to juggle two offices. I went to graduate school at U of M in Ann Arbor. I did my internship in Detroit. I miss the weather there!